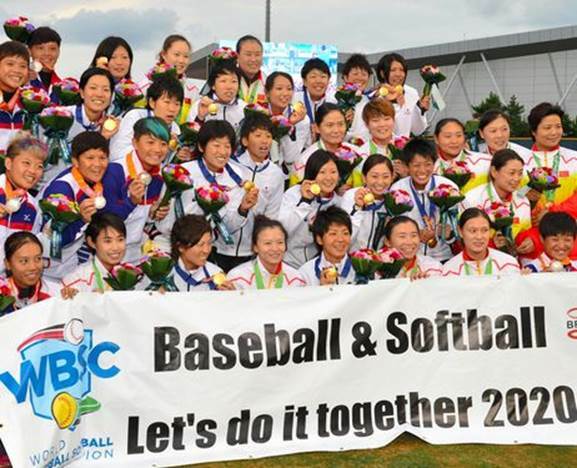 Softball teams from Japan, Taiwan and China at the Asian Games in South Korea in October pose with a banner demanding that baseball and softball be included in the 2020 Tokyo Olympics. MONACO--Men’s baseball and women’s softball, two sports that Japan excels in, are expected to return as official events for the 2020 Tokyo Summer Olympics following revised rules on hosting the Games. The International Olympic Committee at a Dec. 8 extraordinary general meeting here voted on 40 proposed revisions for organizing the Olympics and came up with what it called the Olympic Agenda 2020. One IOC-approved recommendation called for abolishing the limit of 28 for the number of sports at a Summer Olympics. Another recommendation was granting host cities the right to suggest “one or more additional events” for their Games and to hold certain events outside the host city or country. More than two-thirds of the 96 attending IOC members supported this recommendation. IOC member Camiel Eurlings from the Netherlands said that allowing cities to suggest and hold events that are popular in their nations would offer a good opportunity to promote the sports in the international community. Karate, which originated in Japan, and squash, which has been gaining popularity worldwide, could be included for the Tokyo Games. But baseball and softball are expected to be the first choices of the Tokyo Olympic organizing committee. “There are many fans (of the two sports) in Japan, which should help bring everyone together to support the event,” a committee member said. Both sports were dropped as official events after the 2008 Beijing Olympic Games. The Japan Consortium, a joint venture set up by Japan Broadcasting Corp. (NHK) and the Japan Commercial Broadcasters Association, agreed with the IOC to pay 66 billion yen ($550 million) for the broadcasting rights to the 2018 Pyeongchang Olympics and the 2020 Tokyo Olympics--nearly double the price for the two previous Olympic Games. Broadcasting sources speculated that the cost “included the reapproval of baseball and softball” by the IOC. The World Baseball Softball Confederation has also been calling for reinstating the two sports in the Olympics. The confederation was initially two separate organizations--one representing baseball, one representing softball--but they decided to team up to coordinate their efforts. Japan has been a perennial medal contender in baseball and softball, and packed venues are expected if the sports are held at the 2020 Tokyo Olympics. High viewer ratings are also likely for television broadcasts of the events. The selection of sports for the 2020 Tokyo Olympic Games will be finalized at the IOC session in Kuala Lumpur in summer 2015 at the earliest.